The introduction likens the fandom of sci-fi to a religion. 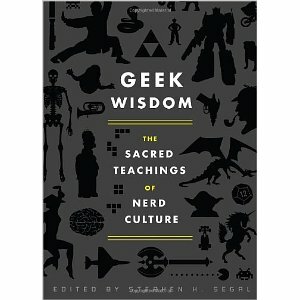 Comparing the passion of science fiction fans to those who are firm religious believers and Asimov’s Laws of Robotics to religious writings, they make their case that geekdom is a religion with the words contained within this book are a compendium of sacred writings from the “holy scriptures” that geeks hold dear. While geeks are widely known to quote from their favorite books and movies, I had never before considered the writings of Stan Lee or the oft repeated lines from Saturday Night Live to have the gravitas of the Ten Commandments. Each page is broken into three parts. The top of each page is a quote, the middle of the page is expounded upon by the writers and the bottom of the page is a piece of trivia related to the quote. While the quotes are usually accurate, the commentary tends to be a mix of expanding on what is written on the quote and in the scene and commentaries that the writers opine about geek culture tangentially based on the quote. The trivia on the bottom of the pages mix between informative and unnecessary, like the trivia related to Dune that read “The Dune saga becomes extremely amusing if you imagine that the spice was, in fact, coffee.” No it doesn’t. While Geek Wisdom is amusing, it comes across more as a treatise on pop philosophy using quotes from popular fiction as its jumping off point. Using V from V for Vendetta to talk about free speech is interesting, it lacks depth and history and could have mentioned Guy Fawkes instead of Cory Doctrow. Its biggest downfall is the lack of depth, replacing deep information with a light, breezy writing style that makes for quick reads between other tasks.